Shiva is a Hindu deity, the third person of the Indian “Trimūrti” or trinity. He is the deity of destruction, he is also but the one responsible for creation, says the hindu culture, a role which at first appears to be opposed to his main feature, but which naturally merges with it, according to the ideas of Indian philosophy. Death allows the continuity of life, opening new possibilities of improvement of the being. This system of thought is based on the law of karma and the cycle of life and death (samsara). The reincarnation of the spirit allows one to return in a physical body to the earth to continue learning and evolving before reaching liberation. So who is Shiva? The destructive role attributed to Shiva is first and foremost the destroyer of the old man, his attachments, his beliefs, and his individual self. He destroys the old to renew. His horse is the bull Nandi. He uses the Yoga that he teaches as a mean of evolution; he acts as Mahayogi, the supreme yogi. He bears the name of Rudra in its hard and terrifying aspect (for those who do not wish to evolve). Parvati plays a larger role than the other deities. She learns from Shiva the galactic dance. 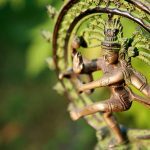 He actually embodies the master of this dance, often symbolized in statuary as Nataraja. Hindu folklore says that Shiva is the transformer and the superior leader of Trimūrti, who succeeds the Vedic trinity. The most famous feature of Shiva is his third eye, which has the power to strike down what he is looking at; that is why he keeps it closed. Shiva protects the earth from Gangâ force. The three-eyed and five-faced being, the crowned-moon, the lord of the mountains, the fire-cracking Lord, The fire of Agni that burns, the ancient man with the bushy hair, the immutable, etc. Rudra the Lord of tears, because he makes men cry when a loved one leaves them and they pass away. But Rudra also means the one who removes the pain. He has his eyes half-closed because he opens them at the creation of the world and closes them to end the universe and begin a new cycle. Symbol of eternity and wisdom, his third eye gives it a transcendent vision of the world. The Shivaite tradition of Hinduism, thus centered on Shiva, is one of the most influential variants of Hinduism with the Vishnu tradition.